A game you've probably never heard of may soon hold the world record for most unique commercials shown in a single day. When you're trying to promote the spiritual sequel to a PlayStation game released more than a decade ago that was barely noticed back then, you've got to be creative to get the word out there. Namco Bandai's furry-friendly action-RPG Solatorobo fits that bill and is trying to make a splash in Japan by going for the most commercials shown in an 8 hour period. Solatorobo is the spiritual sequel to the PS1's Tail Concerto. See, I told you you've never heard of it. Both are developed by CyberConnect2, recently known for bringing a giant space Buddha to Capcom's Asura's Wrath, and star anthropomorphic animals in 3D adventures reminiscent of the Mega Man Legends series. On October 21, a Solatorobo promotion will take over Japanese television network Tokyo MX TV. Over the span of 8 hours, 100 different commercials for Solatorobo will be shown. That's one commercial for every 4.8 minutes. Namco Bandai is attempting to achieve a Guinness World Record with the promotion. Rather than each commercial being a small variant, they'll reportedly have the theme of an "encyclopedia." 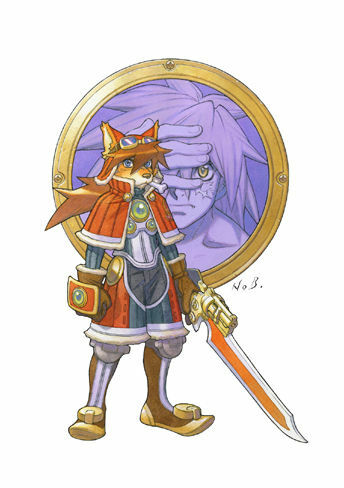 Each will give a new tidbit on the Solatorobo story, including information about Red, the anthropomorphic fox main character that rides around various mechs, and the fact that Solatorobo takes place on an island floating above a sea of deadly plasma. The idea sounds like it could be overkill, though I doubt there will be many people watching television for 8 hours straight, so it may just expose the game to lots of people and give it the positive press of having a world record. I can't say I would mind a similar promotion over here for say, Fallout New Vegas or a similar title, because at least it would stop TV commercials from being such a drag. Solatoboro is scheduled for release in Japan on the Nintendo DS on October 28, with overseas possibilities not yet mentioned.